Ellen Samuels is an associate professor and Faculty Director of the Open House Gender Learning Community. 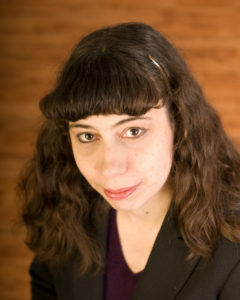 She is also a founding member of the UW Disability Studies Initiative. Her critical work has appeared in numerous journals and anthologies, including Signs: Journal of Women in Culture and Society, Feminist Disability Studies, GLQ, MELUS: Multi-Ethnic Literatures of the United States, The Disability Studies Reader, and Amerasia. Her awards include the Ed Roberts Postdoctoral Fellowship in Disability Studies, the Catherine Stimpson Prize for Outstanding Feminist Scholarship, and two Lambda Literary awards. She is working on two new books, Double Meanings: Representing Conjoined Twins and Body of Mine: A Memoir in Genetic Sequence. Her research interests include disability studies; feminist/queer theory; 19th-21st century American literature; African American studies; body theory; visual culture; creative writing; autobiography and memoir. Fantasies of Identification: Disability, Gender, Race. New York University Press, 2014. “Six Ways of Looking at Crip Time.” Disability Studies Quarterly 37.3 (2017). N.p. Web. “How Do Early Americans with Disabilities Act?” Early American Literature 52.1 (2017): 169-176. “Prosthetic Heroes: Curing Disabled Veterans in Iron Man 3 and Beyond.” Disability Media Studies: Media, Popular Culture, and the Meanings of Disability. New York University Press, 2017. “Passing, Coming Out, and Other Magical Acts.” Negotiating Disability Awareness: Disclosure and Higher Education. University of Michigan Press, 2017. “‘Vulnerability and Power’: Disability, Pedagogy, and Identity: An Conversation with Ellen Samuels.” Interview by Sarah Chinn. Transformations: The Journal of Inclusive Scholarship and Pedagogy 25.2 (2015): 147-157. “Don’t Film Us, We’ll Film You: Agency and Enfreakment in the Joined for Life Documentaries. Different Bodies: Disability in Film and Television. McFarland Press, 2013. Tongue.” Amerasia Journal 39.1 (2013): 19-32. Signs: A Journal of Women in Culture and Society 37.1(Autumn 2011): 53-81. Recipient of the Catharine Stimpson Prize for Outstanding Feminist Scholarship. GLQ: A Journal of Lesbian and Gay Studies 9.1-2 (Spring 2003): 233-255. Reprinted in The Disability Studies Reader, 4th ed. (Routledge, 2013). Translated into Czechoslovakian in Antologie textů z oboru disability studies. Ed. Katerina Kolarova. Prague: Slon, 2012. Translated into Hebrew by the Van Leer Jersualem Institute (forthcoming). Women’s Studies Association Journal 14.3 (Fall 2002): 58-76. Reprinted in Feminist Disability Studies (Indiana University Press, 2011).